Celebrate spring in Florida with international cuisine around the World Showcase, enjoy free nightly concerts by headlining acts, and great examples of horticulture throughout the park. Discover globally inspired flavors while enjoying local craft beers and beverages from around the world every weekend, along with headliner entertainment, through May 5. Check out the menus here. Discover globally inspired flavors while enjoying local craft beers and beverages from around the world every weekend, along with headliner entertainment, through April 28. This family-friendly event will feature over 100 food and craft vendors, live music, a kids farm zone, u-pick blueberries, and a wine tasting school ($10 per person, must be 21 or older to participate). Also April 13-14. Guests will enjoy an assortment of ice cream served by celebrity servers and provided by Kelly’s Homemade Ice Cream. Other treats include: Jeremiah’s Italian Ice, Peak Season Pops, The Father’s Table Cheesecake, popcorn, and Publix cake. This is a spring version of Oktoberfest, complete with sausages, pretzels, beer, polka music, people dancing in Lederhosen and Dirndls, and so much more. From 2-6pm, taste all kinds of different chilis from the hottest of the hot, to the hearty and mild, then vote on your favorite. This annual fundraiser benefits the Volusia Firefighters Charities. Enjoy an 8 course tasting menu featuring the Game of Thrones Scotch Whisky Collection. 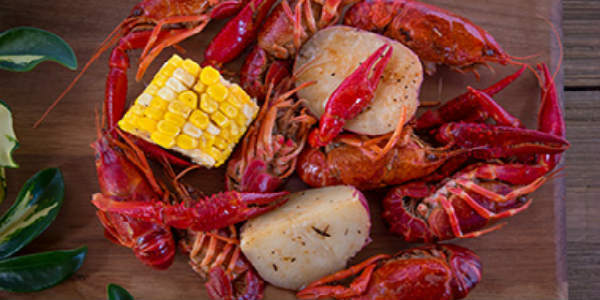 Serving up a live crawfish boil with corn, potato and more. Master Sommelier Jesse Becker will guide the class through a fabulous lineup of reds and whites from the 2014-2017 vintages. Register at the link above. Serving up Vegan Thai Red Curry: Seared Soy protein simmered in a coconut milk red curry with veggies and served with fragrant jasmine rice. They will be unveiling the Spring Issue featuring some pretty tasty cocktails. Enjoy live music and happy hour specials on light bites and drinks. The Taste of College Park combines food, wine, music, silent & live auctions for an extraordinary evening in College Park. Nearly two dozen local restaurants and distributors provide the food and wine; local retailers supply items for the silent and live auction. Enjoy $1 tacos and $5 burritos from open to close at this vegan eatery. Enjoy a collaborative dinner prepared by Chefs Hari Pulapaka of Cress Restaurant, Patrick Story of Hollerbach’s Willow Tree Cafe, and Dalton Lacey of Busters Bistro. Also includes admission to tomorrow’s Brews Around the Zoo. Enjoy select wines, sparkling wines and expertly prepared gourmet foods from each of the hotel’s restaurants. Visit each wine and food station as often as you like throughout the evening. Taking place only a handful of times each year, the dinner features five expertly prepared dinner courses that the hotel’s award-winning chefs pair with local or regional specialty craft beers. Featured brewery is Left Hand Brewing Company. Join Winemaker Melissa Stackhouse as she shares her passion for the artistry behind winemaking coupled with an appreciation of a balanced lifestyle. Her wines will be paired by dishes from the Publix chefs. The second Florida location of this retro-themed pizza place hosts its grand opening at Hamlin the Town Center of Horizon West. First 50 guests each day receive one free 11” pizza (one per person). Saturday, enjoy beer samples from noon to 9pm. Guests who mention this offer will receive a free, small queso at any Tijuana Flats location with the purchase of any regular-priced adult entrée. Starting Friday, fans can also enter for a chance to win $50 in Flats Cash by sharing a photo or video on Facebook, Instagram or Twitter, tagging Tijuana Flats and using #CheesyForFlats. This adults-only night, benefiting the Zoo, will feature food samples from local restaurants, live music, special animal encounters, and over 30 different craft beers. Must be 21+ to attend. Two seatings. Serving up a multi-course chef’s choice celebration of the varied cuisines experienced on the salty Pacific shoreline, mountainous Andean region, and lush Amazon rainforest with influences from Peru’s diverse immigrant roots. Adventurous spirits will enjoy an offering of seafood and vegetables dressed in authentic aromas and spices. Guests are encouraged to bring their favorite beer or wine. Also on April 20. Join Glass Knife’s talented team as they lead you through an interactive, step-by-step course on manual brewing, explain basic coffee terminology and share insights on Onyx Coffee Lab, the coffee proudly served in every cup at The Glass Knife. Enjoy unlimited tastings from local breweries and wine providers. Nona Adventure Park activities additional cost. Each team will be given the same mystery basket of ingredients and 1 hour to prepare 3 plated courses. At the end of the challenge you get to sit and enjoy the foods created as well as some wine. Gather for a fun day of shopping, wine tasting, charming Sole Mendishing up must-haves on silver platters, and more. 100% of each ticket sold supports Second Harvest Food Bank of Central Florida’s efforts to fight hunger in our community. For this event, The Salty Cow LLC has curated an amazing assortment of fine cheeses, charcuterie and pickled veggies that pair perfectly with a hand picked selection of Swan beers and guest taps. This event includes welcome bubbly and a guided blind tasting of three whites and three reds paired with cheese and charcuterie with Master Sommelier, George Miliotes. This family-friendly event will feature over 100 food and craft vendors, live music, a kids farm zone, u-pick blueberries, and a wine tasting school ($10 per person, must be 21 or older to participate). The April book Perfect Peace by Daniel Black. The vegan meal prepared for it will be Smoked Collards & Artichoke Dip, plus No “Mis-Steak” Feta & Roasted Sprouts Flatbread. Enjoy sandwiches at different locations around Orlando at this monthly eat-up. Just pay for what you order. Chef V of Sekushi on the Beach, located on Clearwater Beach, gives a first taste of the menu offering of his new restaurant. Come and see how their ramen is prepared, with their tender braised pork belly. Learn how to make your own folded potstickers with Sekushi’s special pork filling, and lastly making your own sushi roll. Dig into four organic mini doughnuts paired perfectly with four organic brews (5 oz sampler glasses) at this guided pairing. Enjoy a 5-course dinner with wine pairings. Menu at link above. All the wines to pair with a your favorite lobster rolls, lobster grilled cheese, lobster quesadilla, soups and whoopie pies at this pop-up event. Enjoy an exclusive 4 Course Wine Dinner crafted by Head Chef Scott Copeland with pairings from Sauska Cellers & Traditional Wine Innovations. Enjoy a 4-course dinner with bourbon pairings, guided by Phillip Lux, Global Brand Ambassador. Enjoy a 4-Course experience inspired by the vibrant and bountiful world of ASIA and beyond. Vegetarian option available. Enjoy a meat-free, vegan, three-course dinner, while observing an entertaining culinary demonstration by vegan chef, Brad Myers. Click the link above to reserve your free slice of pizza sponsored by Flippers Pizzeria, Pizza @ Lake Eola & Mellow Mushroom. Chef Hari will teach a limited number of students how to develop flavours and dishes inspired by the vibrant and fresh cuisine of Thailand. Class starts at 10 and ends (including lunch) by 2 pm. Featuring the best local, national and international beers, drinks & BBQ food. Two seatings. Serving up a multi-course chef’s choice celebration of the varied cuisines experienced on the salty Pacific shoreline, mountainous Andean region, and lush Amazon rainforest with influences from Peru’s diverse immigrant roots. Adventurous spirits will enjoy an offering of seafood and vegetables dressed in authentic aromas and spices. Guests are encouraged to bring their favorite beer or wine. Also on April 13. Grab some amazing food from 30+ food trucks, drinks from the bars, and enjoy live music outside. This month’s libations feature Tequila. Cost includes your 3 cocktails and 3 brunchy courses. Chefs Aram Mardigian (Wolfgang Puck American Grille, Atlantic City), Andrew Skala (CUT, Washington D.C.) and Tetsu Yahagi (Spago Beverly Hills) join Michael Tiva (Wolfgang Puck Bar & Grill, Orlando) in presenting a four-course tasting menu highlighting some of Spago’s most iconic dishes. Serving up a 5 course dinner featuring each of the food trucks pairing a dish with the brewery’s offerings. Two seatings. Chef Hari will create some of Argentina’s most beloved dishes including Locro, Empanada de Chorizo, Salmon with Gnocchi, Asado de Tiro con Chimichurri, and Alfajores. Learn how to make Neapolitan Pizza in a wood-fire oven like a certified Pizzaiolo. Plus get $10 off your purchase of $50 or more for your next visit. Menu will include: pig roast, corn on the cob, boiled yuca and mojo, Boca gringo rice, black eyed peas with smoked pork belly and cowgirl candy, grilled watermelon and pineapple salad, ABO slaw, pickled fresno peppers and assorted desserts. Carly Paige, author of SIMPLY SWAPPED Everyday, will be hosting a vegan cheese board demo and serving up healthier cocktails during this cooking demo and book signing event. Celebrate Winter Park Biscuit Company’s anniversary with a special menu from 6pm til they sell out. Enjoy an interactive cookie and beer pairings evening. At Benziger, they are about three things: family, great wine and healthy vineyards. For more than thirty years, they’ve farmed their ranch on Sonoma Mountain and searched Sonoma County for the most distinctive and expressive vineyards. Chris Benziger will pair his wines with dishes created by Publix chefs. Learn to cook a menu that includes Cornbread with Piquillo Butter, Spring Wedge Salad and Individual Clam Bakes. Tapas and dessert are included. Discover the best in Scotches, bourbons, and whiskeys; meet brand ambassadors who will offer their unique insights; and sample dishes from the hottest local restaurants. Enjoy German food, plenty of Munich’s Hofbräu Beer on tap, and live musical entertainment by top-name German bands. Attendees can enjoy menus of delectable foods all cooked onsite by local restaurants and food purveyors. Seafood dishes include such ingredients as mahi, stone crabs, shrimp and grouper, all local and sustainable ocean resources from Florida’s coastal waters. Meat and vegetarian entrees also are offered, along with a diverse menu of side dishes and desserts. Chef Hari will teach students how to develop flavors inspired by the bold and Impactful cuisine of Louisiana. The class is from 10am to 1:30pm followed by lunch. Jon B headlines a day full of Live Jazz Bands, and there will be a Louisiana crawfish boil for purchase. In this class, we’ll celebrate the flavors of Greece as we prepare various sweet and savory dishes, including Stuffed Grape Leaves with Tzatziki Sauce, Traditional Greek Salad, Fresh Pita Bread and the iconic and delectable Baklava. The Science of Wine is not just another wine tasting, but an oenological odyssey with presentations on multiple aspects of wine growing and wine tasting in addition to samples of more than 150 fine wines from the world’s most important wine regions and some of the best food from your favorite region, Central Florida. Science of Wine benefits Orlando Science Center. Take a delightful journey down the coast of California with Winemaker Jeff Cichocki as shares his expertise about Bonterra. Taste wines paired specifically with great dishes by the Publix chefs. The 4th Annual festival returns to the shores Lake Dora at Elizabeth Evans Park with over 100 vendors on hand, live entertainment, kids activities and much more. This month they are featuring Balcones Original Texas Whiskey. Chef Tina will be preparing a Texas size feast worthy of this fine Grain to Glass Whiskey. Come aboard the 3rd deck rooftop and enjoy a four-course tasting menu highlighting Italian wine pairings with new world cuisine. Keep this page bookmarked as I’ll add to it during the month as new events pop up.